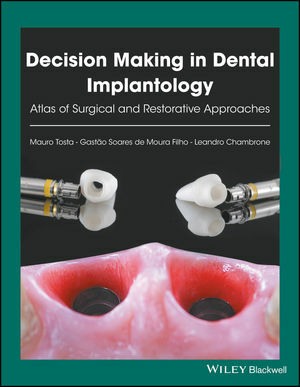 This chapter presents general aspects to be used in clinical practice with dental implants based on the most relevant up-to-date themes for implantology and other fields of dentistry. Also descriptions on the evidence quality rating/strength of recommendation of procedures proposed by the US Preventive Services Task Force (USPSTF) adapted by the American Dental Association are detailed. This chapter provides details on the characteristics of the mostfrequent osseous defects the use of bone substitutes/grafting materials for bone filling and the mechanisms/dynamics of osseous repair. This chapter details the rational and clinical use of different treatment modalities in esthetically compromised areas. Cases 1–12. This chapter is exclusively dedicated to the presentation of clinical treatment alternatives for the posterior sites of the mandible and maxilla. Cases 13–27. This chapter is explains the role of certain phases of performing successful implant-supported oral rehabilitation. This chapter presents offers suggestions for the multidisciplinary construction of treatment approaches for cases presenting high esthetical and functional complexity. These therapies are based on the best evidence available on clinicians’ skills and patients’ desires. Cases 36–41.